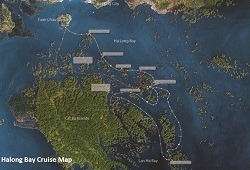 Halong bay cruise 2 day tour sleep 1 night on Fantasea boat for travellers who are looking for a suitable price but with the quality of the tour are not changed , still go to the most highlights in halong bay as Sung Sot Cave,Ti Top Island and beach,Fishing village and enjoin the fresh sea food meals , do kayaking to adventure the beauties of the bay,swimming on the nice places,overnight in a comfortable private cabin with Air con,the itinerary is pick up and droff off is exactly time pointed , friendly professional English speaking tour guide , crew on boat are hospility and nice services. Spending 1 night on the quiet bay with the best cruise – Violet, you will absolutely have best minutes and memories. 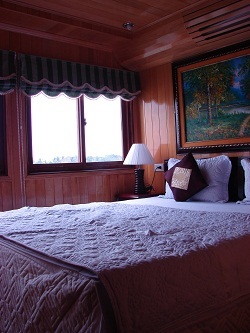 The Violet Cruise provides the luxury cabin and luxury services. 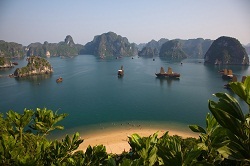 It is not only suitable for your valuable honeymoon but also for whom looking for the comfort and perfect trip on Halong Bay. Spending 1 night on the quiet bay with the best cruise Fantasea , you will absolutely have best minutes and memories. The 3 *** Fantasea Cruise provides the Deluxe cabin and nice services. 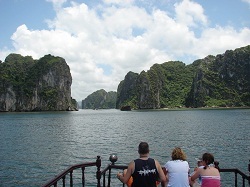 It is not only suitable for your valuable holiday but also for whom looking for the comfort and impressive trip on Halong Bay. dining room, inspire yourself with glass of wine admiring the brilliant sunset of the bay or simply relax with gentle pampering at which is an ideal junk for family gatherings, honeymooners, or couples of friends who love to explore the exotic bay still enjoying, however, elegant comforts. For the best infomation and price please feel free to contact us by email:[email protected] ! 12h00 am Welcome aboard and set sail through bay while lunch is served. Passage into the magical bay, where thousands of sculpted limestone islands rise from the waves like dragons’ teeth. 14h00 swimming on the Ti Top beach , the best beach in halong bay . doing the kayaking to visit the floating village ..
Overnight in a private cabin on boat . 11: 30 The boat returns to the dock for lunch in an A/C restaurant before returning to Hanoi. Trip ends around 4: 00PM. Tip and gratuity for crew members, local tour guide and driver.